Front tyre came off while riding! 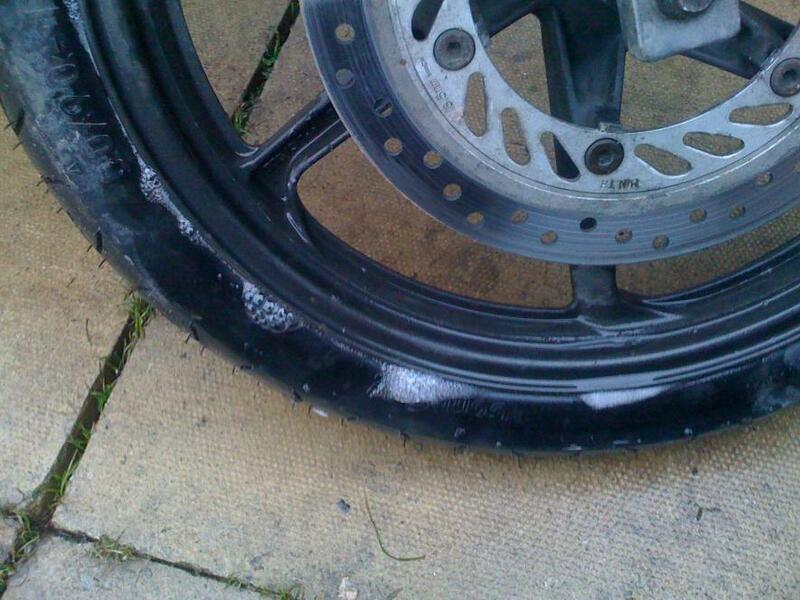 Two days ago I went to replace my front and back tires on my CBR 125. 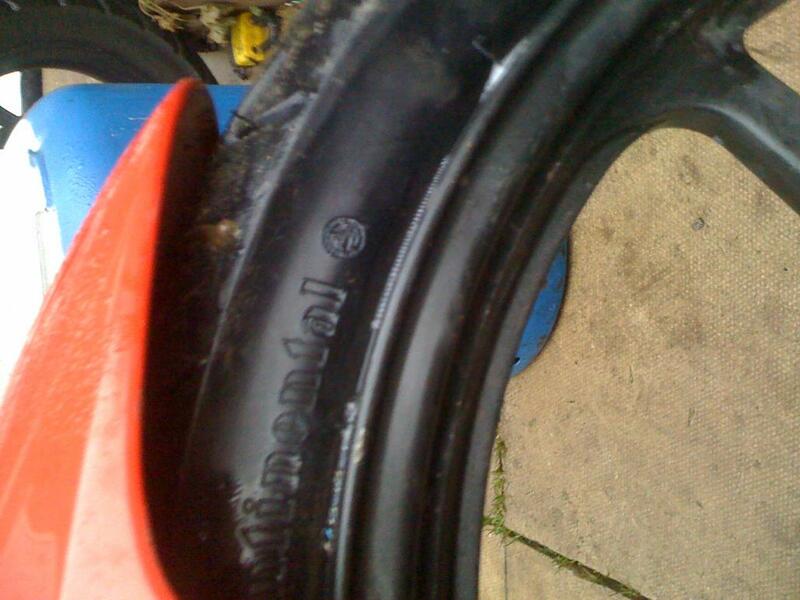 Back one had worn low and the front one had a bulge in the tyre tread. It was about time for a tyre replacement anyways. Anyways, I got them fitted on thursday and then fitted the wheels to my bike as soon as I got them home and had rode about 10 miles from 3pm thursday when they fitted them, to yesterday morning. I set off and about 300 yards down the road I realized that something wasn't right. My handle bars were shaking very unnaturally. I was just pulling over when I heard a clank as my front rim hit the road. I was doing max 30 mph on my 300 yard journey and then came to a frightening stop. I checked my bike over and found that the front tyre had came off its seats inside the wheel and that one side wasn't even on the wheel! So I pushed my bike back to my garden and saw it was completely flat, and after an inspection of the tyre and wheel I found that the tyre fitters had not put tyre lube/sealant on my TUBELESS tyres and the air was just escaping round the sides of the tyres! I pumped my tyre up to pressure and you can see from the pictures that the whole front tyre had no lube/sealant on it at all and couldn't hold pressure. Let this be a lesson to people who are just as careless ( or stupid ) as me sometimes and don't check your bike over every time you ride. And just because you've had something done by a professional, doesn't mean it will be done perfectly (or even properly in my case). Imagine if I had been going round a corner....? Ride Safe, Live Long. Tom. Are you taking it back to the shop ? There is no excuse for that. That right there is crap work. You need to bring the wheels back to the shop and ram them where the sun don't shine. There is a shop here that is owned by a guy I use to ride with. I use to have him do my tires. My brother had him change his tires and found his bike to be all over the place. When he checked, the shop only put 15psi in each tire. When the same shop changed mine, the first thing I did was to check the pressure and found very low amounts in each tire. I will never go back there again, crap work. Just like you mentioned, just because these people make a living working on them does not mean that they know what they are doing or do but don't give a chit about your life. I would however go back to the shop and have words with them before they kill someone. You were lucky that you didn't want to see how the new rubber held and ended up in the tulips. Anyway, the main thing is to keep calm & come to a controlled stop. Sounds like you did a great job keeping calm, cool, & controlled. As for your tire, check those production dates on it. You may have an older tire. Even if its not old, there may be a defect. Perhaps it was just improperly mounted...who knows? A replacement may be in order. That's weird....glad you are ok! 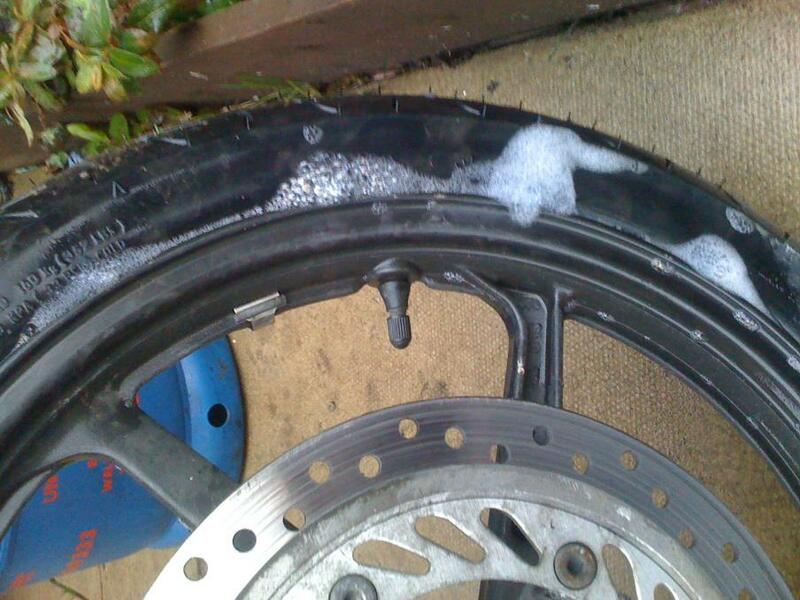 I have done a few sets of tires on my old f3 and am about to do a set on my f4i.....I've never used sealant? Just a little soap and water to set the bead. Never had a problem with it. Too bad you didn't check the air pressure before you left the shop......but why would you? Jeez man. That's crazy. Glad you're ok and like Tim said - i'd go give them a piece of my mind. and Boot. Yeah, Im going in tomorrow and hopefully the shop will be open with the time of year and holidays and stuff. Yeah its crazy s**t, you expect these people to do a good job with the amount you pay them and it will end up costing me if I cant get to work. I know I could sort it myself if I got some tyre paste but am reluctant to do so because it should have been done right in the first time. And xricer, Even that would have done but the tyre walls weren't even clean and they were bone dry. I waited in the shop with my dad and browsed over the showroom and both wheels must have been done in 5 - 10 mins. All I can say is that they must have been missing something out to have them done in that time. That said, I'll never be going in there again, and it wont be the last they hear of me. !!!! REVENGE !!!! Good luck going in there, hopefully you at least get your money back! You should go in with a neck brace and crutches too! I am glad you are okay and this is good advice for everyone to do a pre ride inspection. let us know what the shop says. I dont see any way they could blame you. They might though keep that in mind... I had a tire on my truck rim and all come off going down the freeway at 70mph not a week after I had them mounted and they tried to say it was my fault after talking to the district manager for an hour and a half and explaining to him that my studs broke off. he finally agreed to replace all the studs and check all the remaining tires and to re torque them every hundred miles for the next three hundred. so the best of luck to you and keep us in the loop. Quick Reply: Front tyre came off while riding!